Sidewalk s are put in place for the safety of pedestrians. They provide an alternative to walking on a street surface. It is the responsibility of the property owner to keep the sidewalk clean and clear. Here are a few guidelines to consider for sidewalk maintenance. Your neighbors will be appreciative of your “sidewalk etiquette” efforts. 1) Remove grass clippings from the sidewalk after mowing. 2) Remove leaves, branches, or nuts that have fallen from trees. 3) Do not leave anything on the sidewalk such as a bicycle, skateboard, trash receptacle, or any other items that would restrict passage on the sidewalk. 4) Remove snow and ice from the sidewalk. 5) Do not park a vehicle in a driveway where it will block a sidewalk. 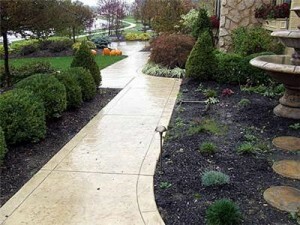 6) Trim hedges or low hanging trees along the edge of the sidewalk. 7) If there is a large crack or hole in the sidewalk, alert pedestrians by spraying a brightly colored paint on or around it until it can be repaired. This is especially helpful for senior citizens who may not otherwise see the crack or hole. 8) Pick up goose or dog droppings as well as trash. 9) Pull or spray weeds growing in the cracks of the sidewalk. This entry was posted in Etiquette Tips, Neighborly Etiquette. Bookmark the permalink.